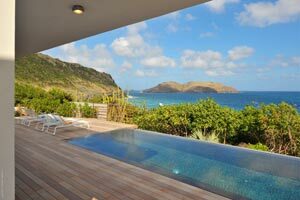 Villa UJV 396, also known as Eranos, is a newly built, 2-level villa, overlooking the Anse de Lezards bay, St Barts. The lower level has two equal bedrooms with a king sized beds as well as a spacious bathrooms with showers. Each bedroom has ocean views, as well as direct access to the large, heated infinity pool and the deck. Behind the second bedroom is a private seating and lounging area, where one can enjoy the afternoon sun sheltered from stronger breezes. In between the bedrooms, there is a small fitness room equipped with cardio and weight equipment. A walled-in staircase offers access to the upper level where a terrace surrounds the living area. Enjoy the refreshing breezes and the gorgeous ocean views from the terrace. The living room has is open to the kitchen. The fully-equipped gourmet kitchen leads to the very private outdoor dining area and lounging area where one can enjoy the sun in the afternoon. At night, the lighting beautifully illuminates the villa and the rock garden. This villa is ideal for two couples traveling together, or families with children over the age of 10. Complimentary bottled water and Champagne to welcome you upon arrival.